Make new friends and learn about all the fun you're about to have in Houston and worldwide. From hiking, biking, traveling, kayaking, socializing and whatever we can come up with that’s fun! Are you new to BCO and curious to discover the ins and outs of what this social, outdoor activity group is about? Perhaps, you just need some tips on navigating the website, or you're still a little nervous about attending an event or outing alone. This event is designed specifically for YOU! Just want to say hi? Awesome, we like you, too! Whatever your desire for attending, DO IT! You'll meet folks in the same exact boat as you, and you'll learn a whole lot about the upcoming fun Bayou City Outdoors has coming your way. 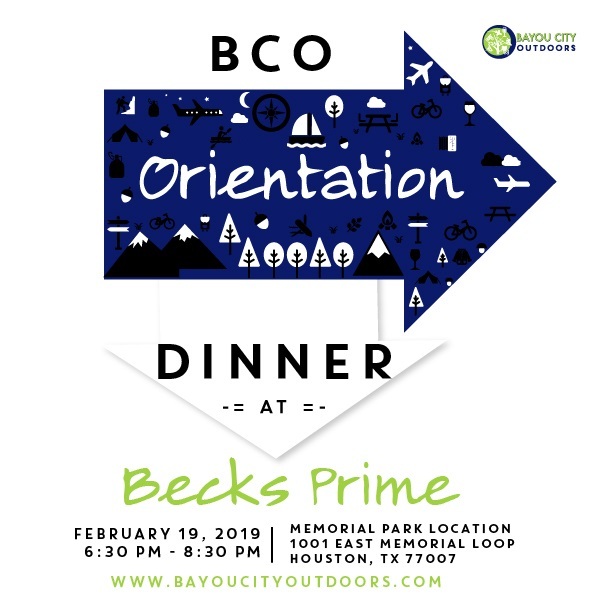 Our calendar can be a little overwhelming with 80 to 100 events every month, so let us explain some of our favorites, and tell you everything you need to know about being a BCO member. We'll fill you in on the perks, discounts, loaner gear, buddy program, website, RSVP system, insider member tips and so much more. There is no charge for the event, but you do need to pay for your dinner.